As the vaping industry moves forward, people are demanding more from their mods, and Emit Vapor is answering that demand. The Ambassador mod utilizes a 26650 battery, and gives approximately 300% more battery life than an 18650 battery. With it's sleak seamless appearance, the Ambassador is the answer to an industry begging for a solid, hard-hitting device that isn't an eye-sore, or difficult to operate. On top of all the wonderful aesthetic options you have with the Ambassador mod, it is also made out of 304 medical-grade stainless, and has contacts that are 99.9% pure copper that get hard-silver plated... this means that however good it looks, it will hit even better! 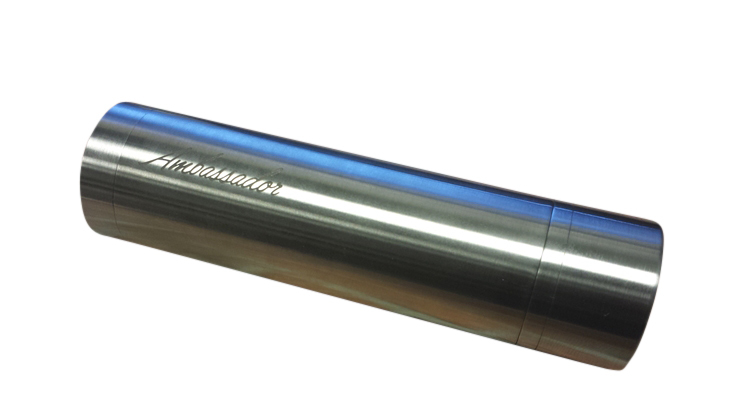 Manufactured by HPM Manufacturing, LLC for Emit Vapor. Uses A Single 26650 battery. 510 threaded top cap (will accept most atomizers). Floating upper contact that auto-adjusts. Delrin-Insulated Battery retention spring that auto-adjusts. Specially formulated and hardened silver-plated contacts (99.99% pure copper core). Vent holes in button assembly. Laser engraved Flag with Emit Logo, and Ambassador name. Ambassador 26650 Mod by Emit Vapor.